Snowmass Royal Knight is the spitting image of his sire, Snowmass Royal Bronze, only he is a True Black! PERFECT! Like his sire he has extremely FINE fiber over his entire body. 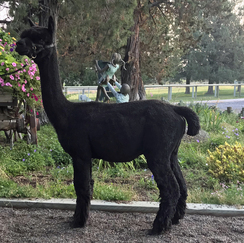 If you can imagine a vicuna, with fine black fleece covering its whole body and having a long staple length, you can envision Snowmass Royal Knight. 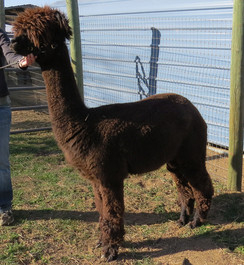 Sonora is a beautiful bay black female sired by Aladdin of KPR out of 5Peruvian Royal Inca Legend. She won Reserve Champion and First Place at the 2008 Alpaca Breeders of the Rockies Fall Festival; Reserve Champion and First Place at the 2008 AFCNA Continental Fleece Show; 1st Place at the 2008 Great Western Alpaca Show; and brought home many other ribbons from the 2008 and 2009 show strings. 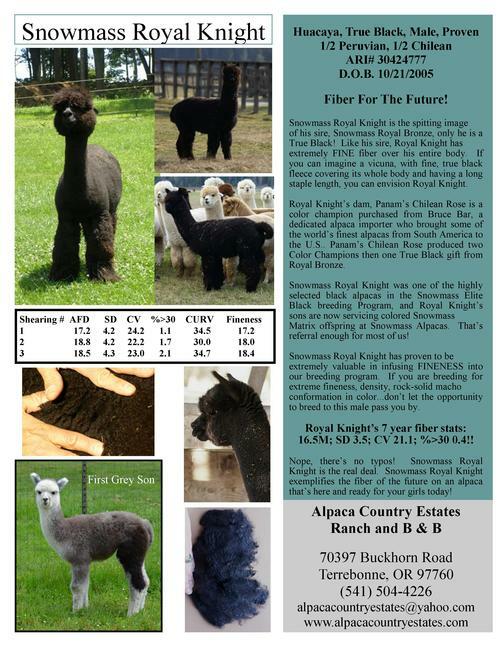 Estates Sasafrass' sire is Snowmass Royal Knight, a true black male with Vicuna style fleece. Her famous paternal heritage includes Snowmass Royal Knight, Snowmass Royal Bronze, and Snowmass Andean Bronze. Estates Sasafrass' dam is Sonora of FRA, a two-time Reserve Champion and multiple Blue ribbon winner! Her awesome maternal genetics include 5Peruvian Royal Inca Legend and Aladdin of KPR!